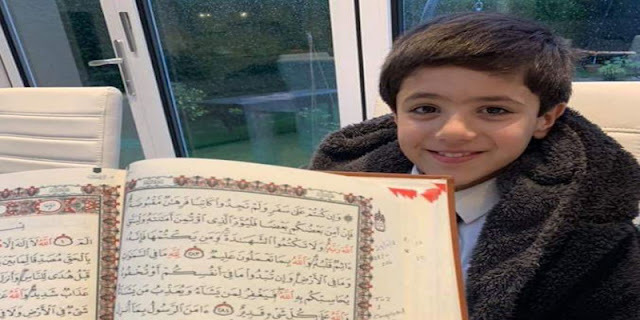 A 7-year-old boy from Luton, England has memorized the entire Qur’an at the age or 7, following the footsteps of his older sister who made this accomplishment at the same age two years ago. “(It felt) like being in a dream. I never ever dreamt I could achieve this. Allah (SWT) has truly blessed us to be able to go through this journey,” the mother of Yusuf Aslam told Ilmfeed. “Allah says I will make it easy for you if you try, and He did,” she added. Yusuf’s elder sister Maariya made the same achievement two years ago. The young girl assisted her brother in his journey to memorize the Qur’an. “Maariya has stepped in at times when I’m busy. Maariya’s hifz ability is exceptional and she has been a constant source of support whenever required,” the mother said. The journey to have two kids memorizing the entire Qur’an was not easy though rewarding at the end. “I’ve given up my career to educate my children; both in the Islamic upbringing and educationally. As a parent, I’m blessed to have children who cooperate and have a good work ethic/ free time balance. I found it easier second time around,” the mother said. Yusuf’s mother has helped hundreds of parents who message her for advice on her Facebook page. “All parents should learn or know tajweed enough to help their children. This is an absolute must if you want to be involved,” she said.